A yellow flower with long thin leaves of green tinged with red at their pointed tips. 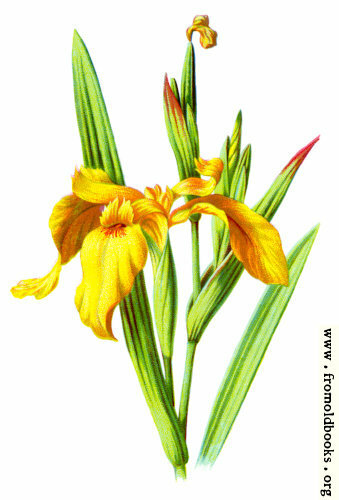 Among the many beautiful flowers that fringe our rivers, the yellow iris, the plant fugured in the present plate, is one of the most beautiful and conspicuous, being perhaps only less striking than the water-lilies, to which pre-eminence over all their lovely rivals must surely be accorded. The plant is known botanically as the Iris pseudacorus.